Guy Richards and his group of motivated people are having a jam from EHT BMX Track to the future home of Patmos Park this Sunday starting at 3:00 pm. (ramp park). Ricci Brana was one of the dudes helping get this park off the ground and was tragically hit and killed by a drunk driver back in July of this year. 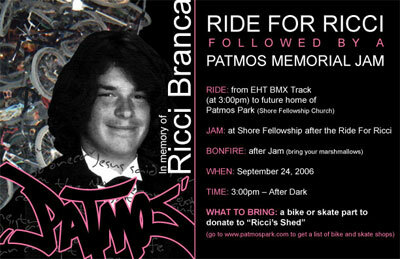 Check the webpage for more info: About Ricci Brana and check out the full site here: Patmos Park I can see nothing more positve going on in NJ for BMX right now than what this gent and his friends are doing. I was invited down with George Hoernig last year to meet Guy and they are well on their way to getting this thing done. Word has it that the groundbreaking begins in October. For more information, hit the links above!